After blowing the TX/RX switching diodes and some switching transistors on the LP board of the OMNI (4 times, repair taking 3 weeks each) I noticed the AMP was oscillating on 20 meters and up when no drive was applied. I decided to modify the AL811H for QSK operation. Here is a working recipe (your mileage may vary....). To bias the 811's dring receive, install 4 zener diodes of about 5V (5 Watts)in series between R8 (the shunt for the Amperemeter) and the T/R relay. This will cut the current off so the AMP does not produce noise during receive. Moreover, duty cycle is lowered as the tubes are not drawing current between dots and dashes. Connect a shielded wire across the diodes (shield to top of R8) and connect to points I and J on the PCB of the QSK5. 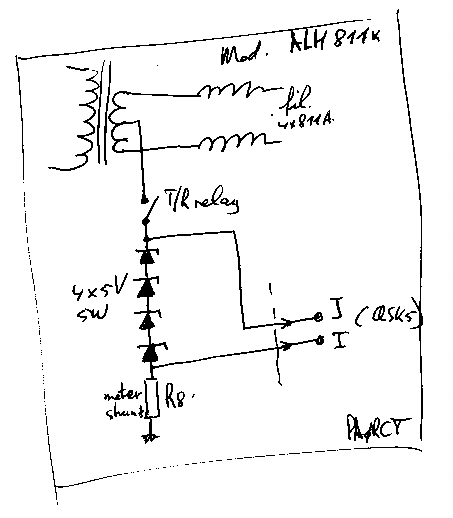 These points are connected to source and drain of the power MOSFET keying output. N.B. : The marking of the pins in the circuit diagram in the manual is WRONG ! Reverse points I and J ! 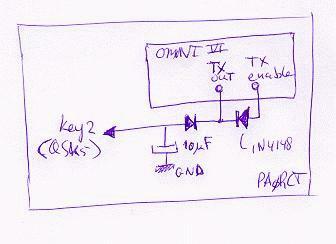 Connect the TX OUT via the diode + capacitor to KEY2 input of the QSK5 unit. The KEY1 input, as well as the ext. relay input of the AL811H are short circuited. You are now enjoying perfect, silent, QSK. (The only thing you hear is the small relay in the OMNI VI). The OMNI (+ the AMP) still produce output when the TX OUT output is already high, switching the QSK5 to the receive position. Luckily, this effectively destroys the small fuse lamps. To delay the switch point from TX to RX a capacitor of about 10 microfarad and some diodes (1N4148) are used. (The TX enable must not be delayed).